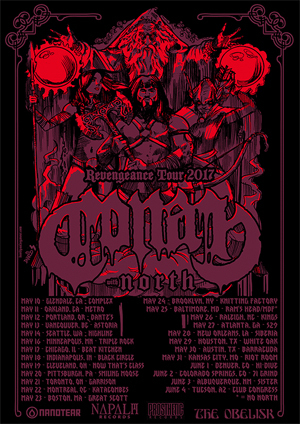 CONAN Release Trailer For Upcoming "Revengeance Tour"
CONAN is a monumentally brutal three piece (in the grand tradition of all the hallowed three pieces through time) hold a sinew-tight line and an iron-grip command over the uber-synchronised powerchord changes and tempo-shifts of the anti-holy trio of bass, drums and guitar. Two weary yet defiant men have the task of vocalizing wretched thoughts over the turgid weight of CONAN's metalized bombast. They bear it well, for the task is immense. Now they bring this immense task back to North America next month on tour with North. This tour is in support of their latest album Revengeance that was released in January 2016 via Napalm Records. Purchase your copy HERE. Today the band has released a trailer for the tour that can be viewed below. In addition to the headline run, CONAN will also take part in this year's Maryland Death Fest and 71 Grind Fest in Colorado Springs, CO. A complete list of dates can be found below.